Note: Thanks for all the messages of sympathy. It was a nice service, but very sad to lose a good friend. I’m sure most of you have had to say goodbye to someone close. Never easy. Travel proved to be a bit of a challenge so I have some catching up to do. Last week was a mixed bag for me, with some nice profits on Monday, yet much of it given away with a scaled in $IWM weekly put trade. It is a key benefit of my process that insulates me from too much pain, as I didn’t risk anymore on the trade than the profits from Monday. That said, I don’t like losing trades and this one clearly was. The continued strength in small caps, especially on large POMO days, remains a cornerstone of this market. In the final phase of bull markets the most stretched sectors tend to become even more stretched. Friday’s weakness continued the year 2000 analog, yet markets again had pushed toward new highs only in overnight action only to be sold again. As it stands we have yet to see any serious corrective activity in the market. In fact it has been 588 days since the last 10% correction. Tick tock. Sunday night we got news that Deutsche Bank incurred over $1.6 Billion in losses and the #DAX barely flinched and tonight futures had been driven back to Friday highs on news that China decided to flood another $42 billion of liquidity into their banking system (to ward of potential defaults). 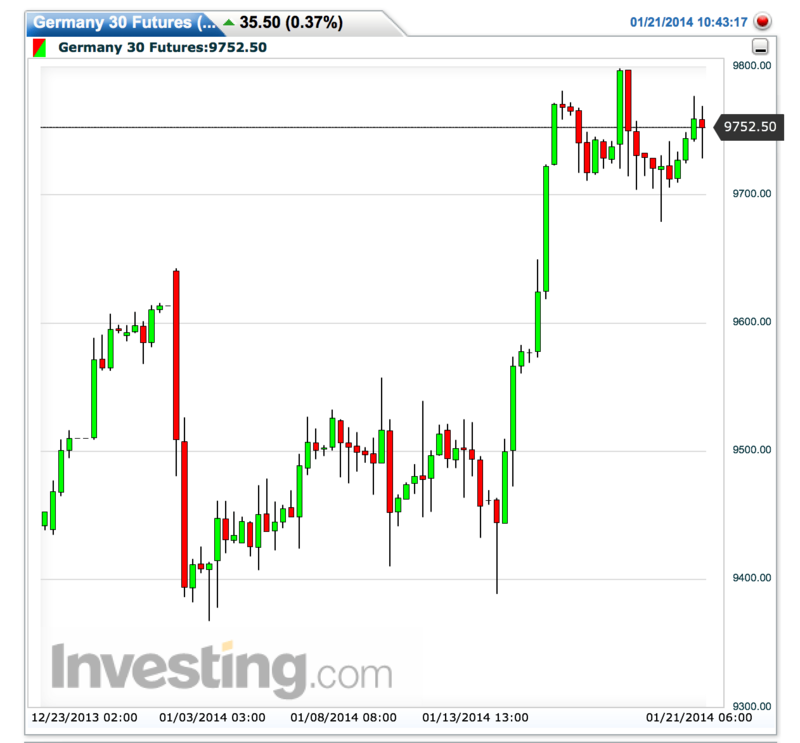 Yet #DAX seems to be sporting an H&S pattern on the 5 hour chart. 1. Seasonality. 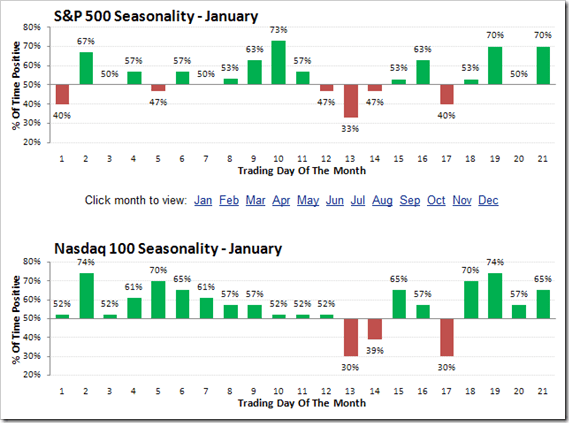 January has an established record of getting weaker starting with the 12th trading day of the month. This is partially driven by beginning of year fund flows ending and of course earnings starting in earnest. So this week in particular has a weak history. 2. The FOMC meeting and tapering is looming by next Tuesday & Wednesday. While all this has been pushed aside it is going to become an issue again for end of week positioning. 3. The year 2000 analog continues to track closely and that time period experienced one very large down day this week. We shall see if it continues to be in play. 4. Earnings so far are not promising to be a big hit. As I outlined in my public article on buybacks there is an alignment process that has to take place. You can grow earnings on buybacks only so long. Bank earnings have been far from impressive in general and retailers are getting hit hard. 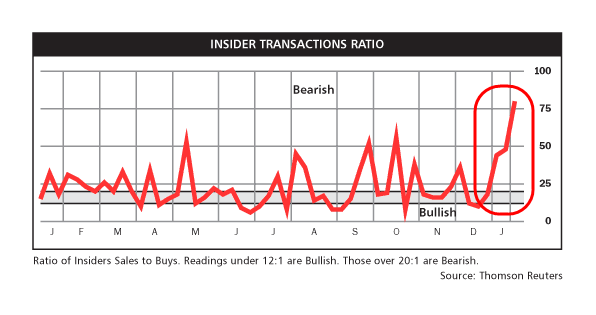 So far then low volume overnight drift seems to be the only upward driving force in the market and maybe I’m not the only one noticing is as we are seeing a large spike up in insider sales. This week markets will be flooded with earnings reports which will open up some lottery plays. My strategy then remains as last week’s: Scale into swing positions while day trading as opportunities arise. 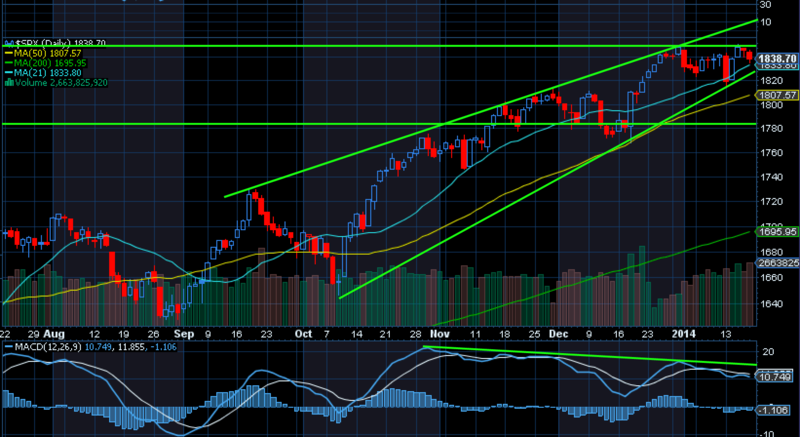 The $SPX chart continues to show potential upside into the 1860 area if the highs get taken out. This has clearly been the pattern of the rally and so many people expect it to happen again as the large divergence continues to be ignored. I was asked what my breaking point on the scale ins would be. The way I define my risk here is the upper trend line of this $SPX chart. An unpleasant development would be a run to say 1,900 which seems to be everyones target now. Per process I maintain a high cash position and will have plenty room to adjust should this occur. Again I’m viewing this as a swing scale in while seeking out the day trades. However such a move would likely cause me to abandon put positions and seek a better entry place. As of yet we have not yet seen such a move and per the points outlined above odds for a weaker close this week are high. One of the key opportunities to me will be to continue to scale into $VIX futures as any serious corrective move will likely bring a very sizable move upward in the $VIX. As far as the monthly charts go indices have maintained a non committal stance versus their year long trend having touched neither the upper or lower Bollinger bands. With only 9 trading days left in the month someone has to make up their minds if they can continue the trend or break it. Risk remains heavily to the downside in my view and hence I maintain that patience will eventually be rewarded. While this market seems to want to continue higher forever one must remember that markets can change on a dime and ferociously so.